Information released by the Government of India's Ministry of Tribal Affairs (MoTA) has suggested that, as on November 30, 2017, as many as 84,694 tribals and other forest dwellers have received the "right" to cultivate forest land under the Forest Rights Act (FRA), 2006, out of total claims 1,90,056, which comes to 44.56% of disposal of pleas put forward by the state's tribal farmers. The data, released by Eklavya Sangathan, a Gujarat-based tribal rights organization, at a media conference in Ahmedabad, suggest that, out of 20 states for which MoTA has released data, as many as 14 states have performed better that Gujarat. These are Andhra Pradesh 83.21%, Bihar 54.04%, Chhattisgarh 97.74%, , Jharkhand 81.78%, Karnataka 60.63%, Kerala 86.55%, Madhya Pradesh 99.28%, Maharashtra 94.55%, Odisha 91.62%, Rajasthan 96.90%, Telangana 94.77%, Tripura 96.14%, Uttar Pradesh 99.85%, and West Bengal 99.94% (click HERE for details). 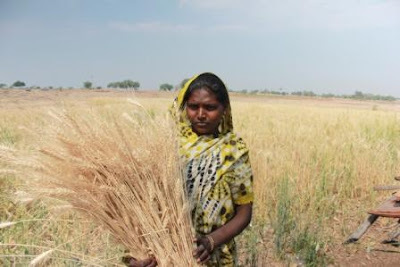 While the all-India average of percentage of disposal of land rights is 87.39%, which is almost double that of Gujarat, Ekalavya's Paulomee Mistry told mediapersons, "Of the 84,694 claims said to have been settled by the Gujarat government, as many as 34,000 tribals and other forest dwellers received the right to cultivate the forest land before 2001, when Narendra Modi came to power in the state." "Ever since", said Mistry, "Those who have been given the right to cultivate the forest land have not been offered land titles. All that about 40,000-odd tribals and other forest dwellers have received since 2001 is a piece of paper of right to cultivate, which even the State Forest Department officials say has no legal value. These include those distributed by Modi ahead of successive elections in Gujarat." Showing these "right to cultivate" papers, economist Hemant Shah, also present at the media meet, said, "I have scanned through a few of them. I was shocked to find that these papers have not been signed by the signing authorities. One of them, for instance, I found, was signed by a medical officer!" He called the implementation of FRA, 2006 "very pathetic", adding, "The state government has behaved irresponsibly and with high-handedness and arbitrariness." According to Mistry, of the 84,694 rights to cultivation, according to the MoTA data, 3,516 are community rights, while others are individual rights. "What is interesting is", Mistry said, "On January 11, 2016, MoTA had said, as many as 7,224 community claims had been filed, and of these 4,597 claims were approved. However, the data of November 30, 2017 give a different figure -- 3,516 community claims approved." 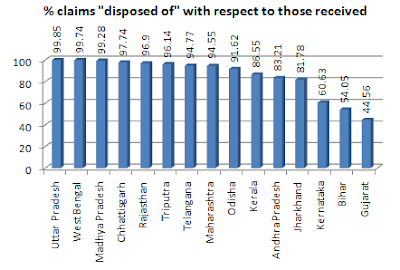 "There is reason to believe, therefore, that the Gujarat government has revoked 1,081 community claims. These community claims, apparently, were not allowed because the Forest Department did not want to part with its control over forest land. Under the law, if the community claim is approved, all the land of the village would be declared as community property, and the ownership of other resources in the village would also be community property." Details provided by Mistry further suggest that tribal farmers have, in all, been given the right to cultivate over 1,27,068.32 acres of land. This comes to 1.57 acres per forest land cultivator. "Actually, under FRA, 2006, tribal farmers are entitled to up to 10 acres of land if they were found to have cultivated 10 acres of land. However, it seems, in several cases one tenth of the land has been allocated", she said. This is outrageous and totally wrong. These are disposal rates, most of them are rejected, while Gujarat has kept them pending for review. Gujarat's "shine" is wearing off , if it was ever real.